Welcome to the seven. Only 3 of 7 Left! West Coast living meets modern contemporary design in these gorgeous three level townhomes with stunning ocean views. 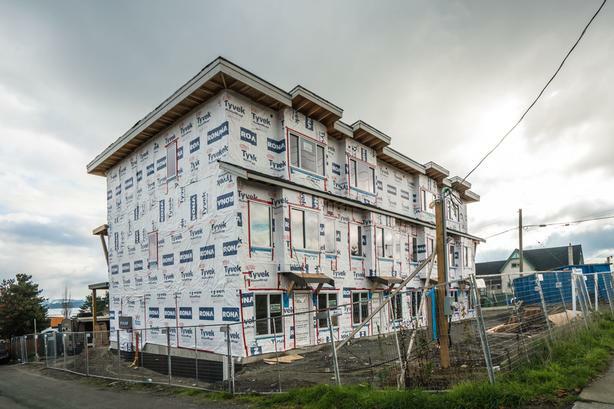 Every town home comes with a City of Nanaimo approved Work/Live space which includes its own separate entrance & is ideal for the self-employed person looking to run a home-based business or rent the space for extra income. Each unit has been carefully designed with the view in mind with perfectly placed decks to take in downtown Nanaimo's gorgeous waterfront. With no rental restrictions, these units are a smart investment or an ideal home for a first-time buyer. Each unit is modern in design with a "Vanilla Oyster" colour scheme which will include white cabinets, light grey paint, gorgeous grey laminate flooring & stunning tile. Close to all amenities including the waterfront, Port Place Mall, the Port Theatre & plenty of restaurants & shops. Close to the ferries and a 20 minute seaplane from Vancouver these town homes won't last long! All measurements are approximate and should be verified if important.